Clearly a vegan hamburger seems like an oxymoron, and if it was made from beef of course that would be the case. 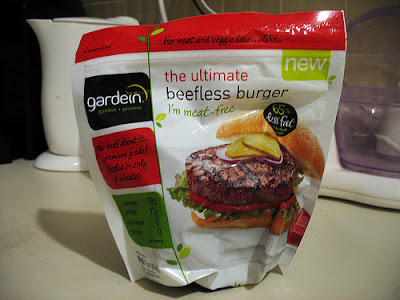 Enter the Gardein Ultimate Beefless Burger. I have served this burger to die hard carnivores and they say it tastes just like a burger. I think it makes on heck of a good substitute and is easy to cook. It's juicy, meaty and has that wonderful umami burger punch. As I often grab this for a quick lunch, I use the microwave, however I have heard it's amazing on the grill or in a pan. Give it a go, and if they don't have it in your area, just ask. Gardein is becoming commonplace, so they can certainly get it. You can find it in the frozen food section. Enjoy!